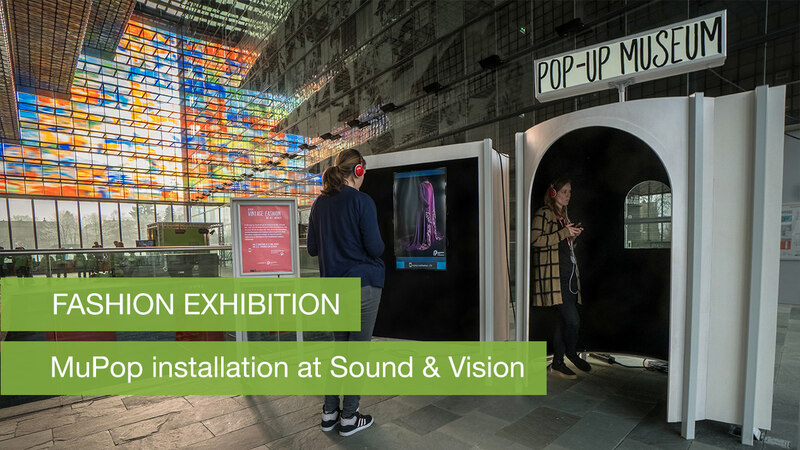 From January 12th to 24th, the beautiful Sound and Vision building in Hilversum provided the backdrop for the latest exhibition to use our Pop-Up Museum. Right in the entrance hall visitors could enter a specially made installation, consisting of three booths with a wide-screen monitor each, and immerse themselves in various aspects of European Fashion throughout the last century. Visitors interact with the Pop-Up exhibition using their own smartphone. There is no need for the visitor to register or install any software, they can simply join by typing a link in the browser of their phone. Once connected, the installation offers different types of phone-mainscreen interactions, such a swiping though the exhibition, zooming into pictures, listening to voice-over explanations and answering a quiz around the content exhibited. More information on the content and interaction that the installation offers can be found in the use-case description available on the MuPop website.